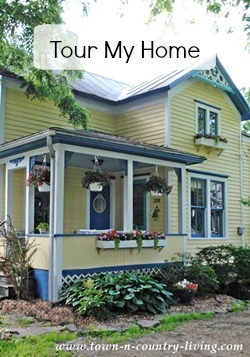 Lately I’ve turned a critical eye to both my living room and family room. Neither room is particularly large, but they’re adjacent to each other with a fairly large doorway so the spaces feel spacious. I thought I would use today’s “Humpday with Houzz” to do a little research and find small space living rooms that I like for future inspiration. I’ve loved this room for awhile now. I pinned it many months ago. The painted wood ceiling, white furniture, wood floors,and chippy painted furniture all come together to create a cozy, inviting space. The touches of green and coral lend an air of happiness. This is the type of couch you just want to sink into at the end of the day (looks like the dog has the right idea!). I’m considering adding a sectional to my family room and one with a casual style like this would fit the bill perfectly. 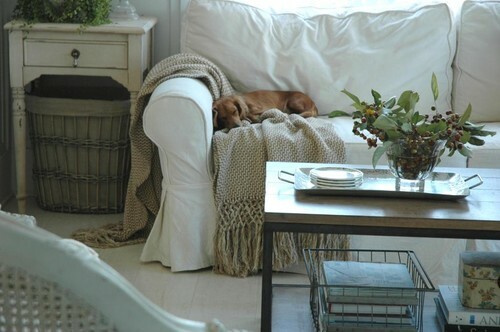 Note the textural touches like the wire and wicker baskets, the rattan chair, and the beautiful throw that puppy seems to love. Architectural details in older homes always appeal to me and I love this little under-the-eaves reading corner with painted vertical planks on the wall. 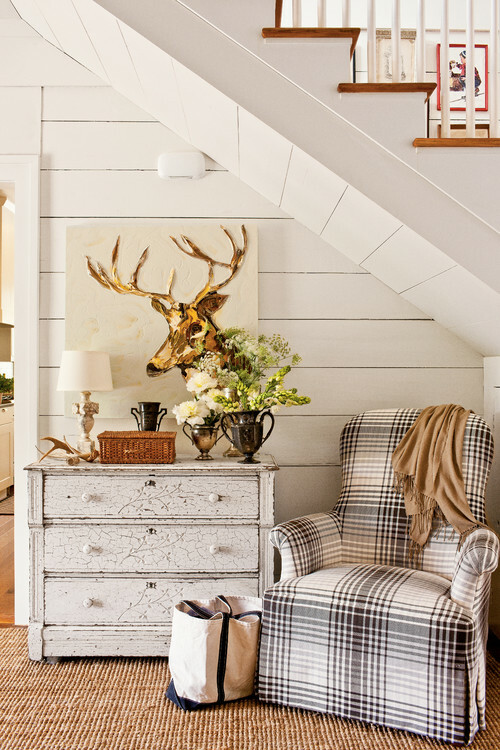 The chippy dresser is paired beautifully with the plaid chair and deer head artwork. 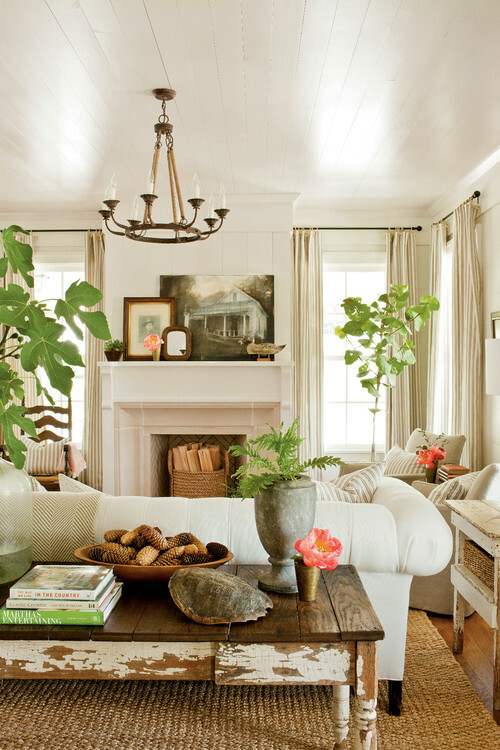 Love the texture of the sisal rug, too. 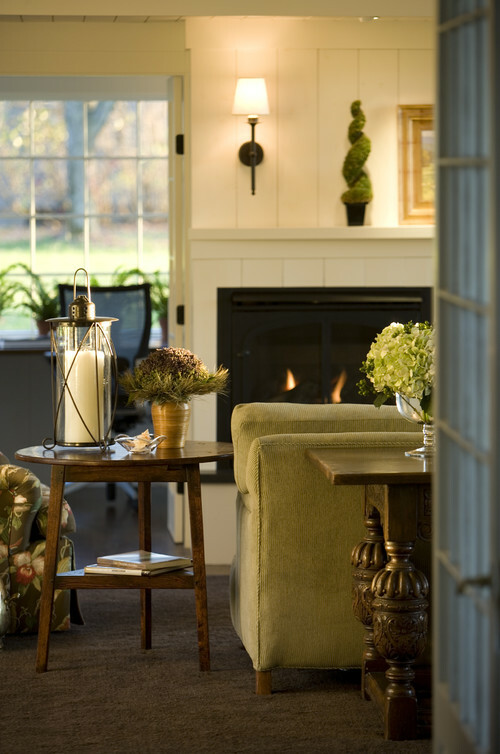 Another cozy, and inviting living space is this modern country style room. I’m starting to notice a pattern developing with the photos I’m choosing. White, wood, a touch of color, and textural elements. I think choosing favorite photos of rooms can be very helpful when trying to determine the look and style you want, because inevitably you’ll start to notice a theme emerging. Yes! This is the type of sectional I’ve been thinking of. Room to sprawl out with my laptop while I blog … and hubby can sit here too and massage my feet while I work! Tee hee. This little corner makes me smile. Another casual, comfy couch … and what an adorable lamp. Speaking of which, I need to find matching lamps for the family room. It’s little details that personalize a room. 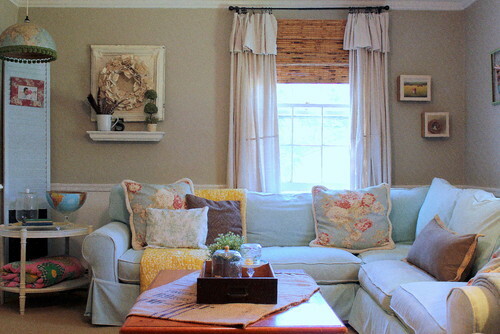 Small space living rooms can be both functional and pretty. How about some color for a change? 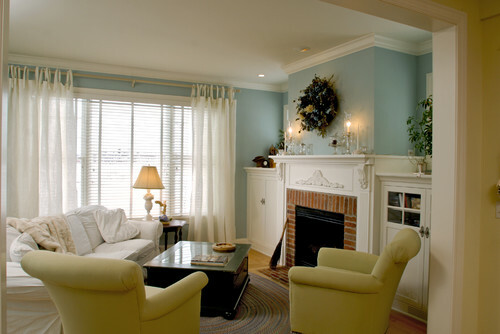 This is such a charming room and proves that a variety of colors can co-mingle and result in a soft effect. 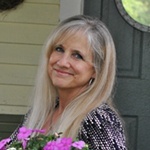 Did you notice the dutch door in the background? That was the first thing I saw! Here’s another example of small space living rooms that use soft colors to add interest, but the fireplace is the true focal point. Love the wall color! Finally, I’ll end with this modern country living room in a bungalow style home. Lots of white (which I love) coupled with pops of color here and there. 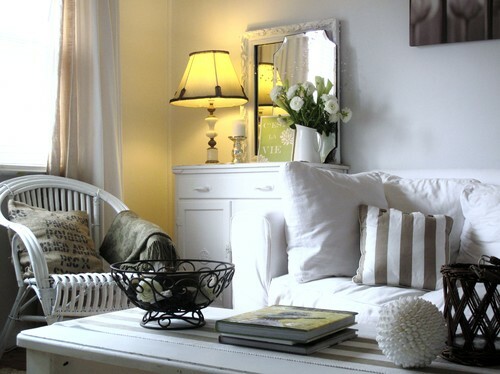 I love decorating with white, which is the reflection of all colors and goes so well with everything. 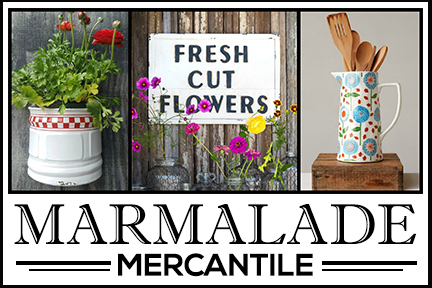 It’s versatile because you can easily change accent pieces when you get tired of something. Which of these small space living rooms did you like best? 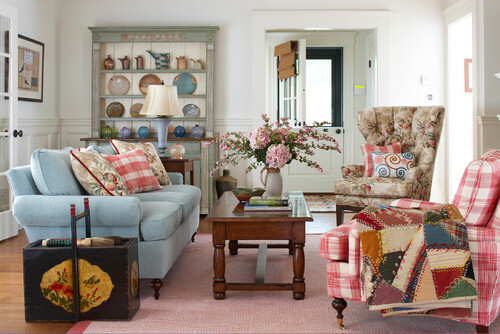 They’re all beautiful…my favorite is the one with the blue sofa and red plaid chair LUV!!!! So hard to decide. I would like to take bits and pieces from each one. I actually have a couple of these pinned myself. I think living and family rooms are the hardest to decorate. 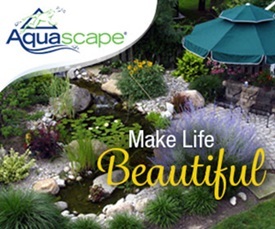 Great inspiration photos! Love all of these comfy cosy rooms, they say “come in, sit down and relax!” Definitely my style. There’s something in each one that appeals to me, can’t choose a fave! Thanks for sharing.